Charter Club Hotel. This is an all suite property with double rooms, kitchens and other amenities. We decided to take the Naples Water Tour Company adventure tour which runs its operation from the docks of Charter Club Hotel. The reason we picked this tour is because it offered sightseeing and adventure. At the docks we meet Rick Clouston (Rick C), the owner, and his partner Captain Rick Traver (Rick T). The trip was more of an adventure than I expected. It was an action packed 2-1/2 hour excursion full of sightseeing, dolphin encounters, boating, jet skiing, swimming and shelling on a secluded beach. “The Ricks” proved to be a classic example of how opposites attract. 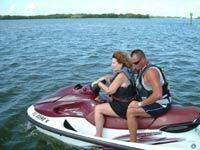 Rick C. is the thrill seeker, who loves his jet skis. 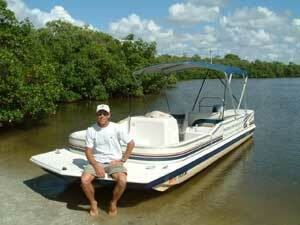 Rick T. is the calm guy in charge of the boat, who is consistently helpful and courteous. Before we began the tour, “the Rick” gave a short briefing about the tour and important safety issues. Then, the excited guests boarded the 22 ft, 12-passenger boat. 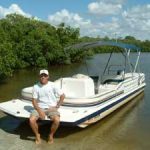 Rick T. drove the boat and played the role of the tour guide, providing guests with background on and sights to see in the area, while Rick C. acted as our personal scout, scanning the landscape for wildlife while he maneuvered his powerful jet ski. 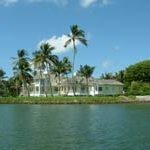 The city of Naples is an ironic combination of millionaire homes, standing proud south of the docks, and an abundance of thriving foliage as you exit the intercoastal waterway. Where the houses stop, nature begins with mangrove trees, small islands, and plenty of sandy shores. As we made our way to the depths of the ocean, we were blessed to encounter our first bottlenose dolphin. We watched as this lone dolphin played in the boat’s wake. It was amazing to see how fearless this dolphin was, even in the abundant presence of boats driving through the waterway. We stayed with this dolphin for a while then headed off towards the inlet to the Gulf where the biggest pods of dolphins play, the “dolphin playground”. Here we watched 4– 8 dolphins taking time out to play. We were fortunate enough to witness a mother and a calf swimming together. We stayed here quite a while to watch these beautiful mammals. I soon found out how difficult it is to photograph these energetic animals! rest, where Rick C. gave everyone an opportunity to ride on his watercraft. We had our choice, ride with Rick, or drive ourselves. I chose to take the craft out on my own. Most of the guests chose to have Rick take them on a thrill seeking ride, which proved to be better then most attraction rides, with dynamic jumps, hard circles, and full throttle speed. The guests loved the ride. We spent about 40 minutes there before, suddenly, Rick C.’s keen eye spotted another mother and calf swimming in one of the canals. We followed and enjoyed the beautiful pair, before heading back to the open water area where we continued the Jet Ski interlude. From there, Rick and Rick took us to a special beach for some lounging, shelling, swimming, and more jet skiing. After a quick dip in the Gulf, I had Rick C give me a ride around the mangrove islands. Rick C. is an expert on the island and its characteristics. I felt as if I was participating in an IMAX movie. I thought for sure that I would either crash or hit my head, but nothing happened. 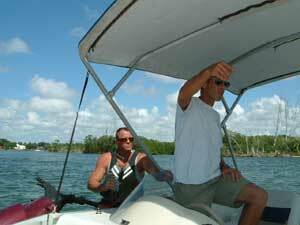 Rick had everything under control, and managed his time well, providing everyone with ample time on the watercraft. After about 40 minutes, we traveled, gingerly, back to the docks in Naples. 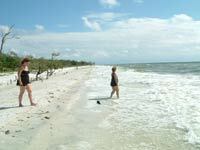 There are several different tours offered by Naples Water Tour. 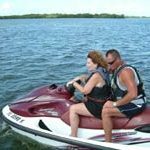 The Adventure Tour, is 2-1/2 hours in length, and includes sightseeing, dolphin encounters, jet skiing, shelling, and beach time. The Dolphin Encounter is a 2-1/2 hour tour that includes everything that the adventure tour includes without the jet skiing and, as you can imagine, more time with the dolphins. For those with less time on their hands, the Sunset Tour is a great choice. 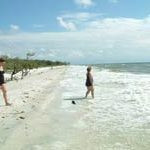 It is only 1-1/2 hours and includes some sight seeing and watching one the best sunsets in the U.S. Naples Water Tours is also willing and able to create custom tours for you and your group. The cost for the Adventure Tour and Dolphin Encounter is $50 per person and $25 for children 10 years old and under. The Sunset Tour is $25 per person. For a fresh seafood experience, eat at the Tiki Bar and Grill near the docks, offering one of the best grouper sandwiches around, 239-261-0978. Tin City, a 23,000 square foot complex, is a bustling hub of restaurants and boutiques. The Pier 41 restaurant was also recommended to us. If time allows be sure to walk along the pier. 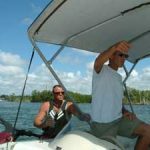 you give “the Ricks” of Naples Water Tours a call. Once you’ve made your reservation, you just need to grab your sunscreen, bathing suit and towel, and drive to Naples for a day to remember. The trip is exciting and worth every penny.